I remember being a young boy, very impressionable, listening intently and soaking up all I could in the martial arts. There was one story I distinctly remember about the belt colors told to me by a kyosa. The essence of the story was that through training, the white belt gets dirty and starts changing colors, and of course, the black belt was the dirtiest. Vivid images of martial monks training in the woods with rope-corded belts flooded my brain in a romantic fashion. Of course, it was just that; a romantic notion. Through study and research I now have a different understanding of the belt itself, and the colors I came to accept as canon. The idea of formalized ranking in any art form, whether it's flower arrangements or martial arts, is very comon in Japanese culture. However, it's clear that before Kano Jigoro, no belt system denoting rank or expertise in Asian martial arts existed. It's also clear that Kano originally had two belts, white to represent kyu/gup ranks and black to represent dan ranks. The different colors of kyu/gup ranks didn't come until the early 1900's. But Tangsoodo is not just Japanese in origin, instead it comes mostly from Okinawa. And the Okinawan karate systems had no belts. It wasn't until Funakoshi (an Okinawan Karateka) moved to Japan to teach Karate in Japan that he adopted Jigoro's belt system for his new Shotokan karate curriculum. The Okinawans later followed suit. With that said, during the Japanese occupation of Korea, some of this Japanese influence filtered into Hwang Kee's philosophy on martial arts. Which is why we practice Tangsoo DO "道", not Tangsoo SUL "術" (Pronounced Jutsu in Japanese). The change from Jutsu "art, skill, techniques, tactics" to Do "way, path" is the result of the Meiji Restoration in Japan in the mid 1800's, where martial arts were evolving from combat oriented skills to centering on the personal development of the individual. Kenjutsu became Kendo, Iaijutsu became Iaido, Jiujutsu became Judo, Aikijujutsu became Aikido, etc... Tangsoodo following suit with the "Do" philosophy, did also with the belt ranks. Originally Hwang Kee had three colors of gup ranks, White, Green and Red. Later in the 70's and 80's, American influence saw an orange and yellow belt added. If you look at the KDA patch, you will notice that only five colors are used, these represent our belt colors. In the Korea Dang Soo Do Association we have 4 gup belt colors; White, Yellow, Green and Red; as well as the Midnight Blue for Dan ranking. The reason for these 4 gup colors is their presence in the original Moo Duk Kwan logo and cultural significance in Korea. 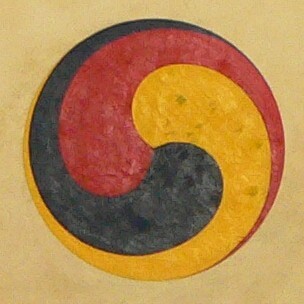 It is important to understand that yellow is a traditional Korean color, used to represent humanity in the Sam Taeguk (pictured left). This is one reason why we use the color yellow instead of orange. Also of note; we do not include a blue belt denoting Chodan Bo. Hwang Kee never implemented such a belt as this is purely an American change, therefore we do not include it. So in the end, be proud that your rank and your belt color has history and philosophical intent behind it. But most of all... make sure you focus on your technique. Knowledge doesn't equal understanding, and belt color doesn't equal knowledge. Get out there and train... train hard!